Mercy versus judgment. These are the two choices that we will face when standing before God and they are the two choices that we have when dealing with other people. Read James 2:12-13. God is ultimately going to judge us. As it mentioned yesterday, if someone failed at just one thing, then they are going to be guilty of the entire law. Still, God has provided a way to show us mercy. Because of that way through Jesus Christ, we have the option to show mercy to others around us. Because we know that breaking one law means breaking the entire law, we know we are guilty. And, we know everyone around us is guilty as well. The question becomes, will we show mercy to others as God has shown mercy to us by offering them an opportunity to be made right? Or, will we seek to condemn some just because we want to judge them. If we choose not to show mercy, why should God show mercy to us? 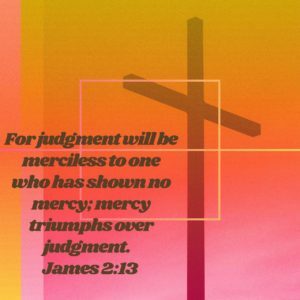 God gave mercy as an opportunity for all. Who are we to decide that someone is worthy of receiving that mercy and another person is not. God is the one who judges, not us. We must be willing to display God’s mercy to all.